Being a woodcarver with a particular interest in knife carving there was no chance that I was going to wear something that impersonal, or carry about a blunt blade for that matter. So I decided to make my own. What is a sgian dubh? The name comes from the Gaelic meaning ‘dark knife’ or ‘black knife’. Although many sgian dubhs (it’s pronounced something like ‘skee-an doo’) will have dark-coloured handles made from ebony or bog oak, the name is thought to reflect the way that the knife was hidden when being worn (‘black’ in the same sense as ‘blackmail’ or ‘black ops’). The first is that no one with any common sense in the old days in Scotland would completely remove all their weapons when visiting others – things were a bit too wild in the Highlands for that. To show respect and friendship to the hosts when in their house, visitors would put their knife into their hose, so that it was on show for all to see as an expression of good faith (although it could still be accessed in a hurry!). Another knife, called a sgian achlais, would also be worn under the armpit. Wearing the sgian dubh on show symbolises goodwill and friendship combined with an readiness to defend oneself if necessary. The other influence on wearing sgian dubhs is thought by some to come from hunting. Knives are carried by hunters and ghillies in Scotland, so that deer can be skinned and gutted (‘gralloched’) in the field and brought back. Trying to get a dead red deer off a Scottish moorland in one piece would be a thankless task; far easier to cut it up first. Gralloching also involves removing the deer’s intestines, which means the meat isn’t tainted by gut contents. The traditional design of a sgian dubh has small dimples along the back of the blade away from the cutting edge. I wonder if they echo the saw-type section on the blade of many hunting knives, which I suppose are used to cut through tough parts of a carcass? Is it legal to carry a sgian dubh in public? 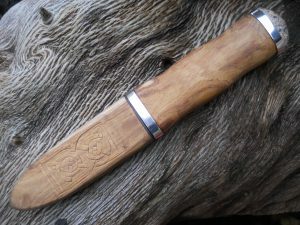 A sgian dubh is part of the Scottish national dress, so it is legal to carry one in public in England, Wales and Scotland when wearing that national costume. There are exceptions, such as particular kinds of knife (a flick knife just ain’t gonna pass for a sgian dubh). Carrying any blade in security-sensitive places and onto aircraft is also not going to end well. The law may vary in other countries, best to check before heading out! At first, I wanted to try and make the blade for my sgian dubh. However, blade making is a real skill involving knowledge of tempering steels and access to suitable equipment. I didn’t have enough time to learn the craft of knifemaking to the level where I would be sure to be happy with the blade in use. 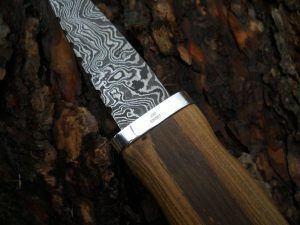 I also fancied having a damascus steel blade (where layers of steel are fused together, to make patterns in the blade). Eventually, I decided to buy the blade from Rab and Tanya at Loch Ness Origins. It is carbon steel so will take a sharp edge, although it will need regular honing as it will dull relatively quickly. I think that it might be a bit brittle for very heavy work, but this knife isn’t intended for that kind of use. The sheath and handle were made from the piece of laburnum wood that you can see above. The tree grew in the garden of the house in which I was brought up, so it means a lot to me and has a strong family connection. My father would hang one end of a hammock from it for my mother to rest in when she was pregnant with me. The tree was felled long ago and the house has been sold since then. The wood was then carved out carefully, to give the space inside the sheath. The sides corresponding to the back of the blade are slightly more hollowed out, as this part of the blade is thicker. I thought about putting a shim of copper into the sheath to protect it from damage, but decided this might just dull the blade and it wasn’t really necessary anyway. The two halves were carefully glued together using Titebond III and clamped. It took a few goes to make sure that the halves hadn’t shifted out of alignment whilst being clamped. Note the bits of paper, to stop any leaked glue from sticking the workpiece to the clamping blocks. The next day, I shaped the sheath with my trusty old Opinel carving knife, rounding the edges to make it comfortable to wear. The grain of the wood is visually quite striking, so I didn’t want too much elaborate carving clashing with it. A simple Celtic knotwork pattern suited the overall design well. The handle was cut from the same piece of wood as the sheath, to give a continuous grain pattern running through both. I roughly shaped the end to go next to the sheath, so that I could shape the rest accurately and find the precise spot for the blade to be fitted in. With careful measuring, holes were then drilled to hold the tang of the blade. The hole also has a recess to hold the sloping shoulders of the blade, so that it fits in flush to the handle. Shaping the handle was done with a knife. Using my Opinel was important to me in the process (as it is the blade that I learnt to carve with) and holding the handle as it was being shaped meant that I could constantly monitor how comfortable it felt in my hand. Once the blade had been fitted and glued into the handle using slow-drying two-part epoxy (I find it less brittle than superglue or Titebond), I noticed that it still moved a little in the sheath. Even though the fit was as snug as it could be, the blade could shift about and loosen itself a tiny bit. I decided to fit a tension spring made of silver (as it would be softer than the steel of the blade) into the sheath. At the same time, a piece of antique ebony veneer given to me by a friend many years ago gave a nice contrast to both the silver and the wood. After gluing in the tension clip, I drilled a tiny hole and fitted and glued a pin made from silver wire, to give extra strength to the join. The clip is just a piece of flat silver, bent into a slight curve with a bit at the end bent to a right angle for fixing the clip onto a recess cut part-way into the veneer. The curved part is fitted over a shallow recess cut into the inside of the sheath. In hindsight, it would have been easier to fit it before gluing the halves of the sheath together, but it wasn’t too tricky to do and the pinned silver does make a nice feature. 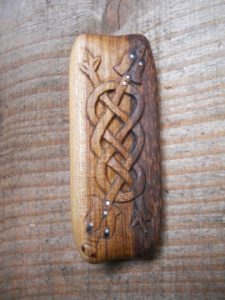 I then decided to use a stone to decorate the end of the handle, There were three choices, which you can see in the image above. The piece of jasper at the front was picked up by me from a stream in the Isle of Man. It was attractive but a bit too small. The larger reddish stone was collected from a stream in the Scottish borders. It was the right size and had the Scottish connection, however I wasn’t sure about the colour or the strength of the stone itself. I decided on using the larger, paler coloured pebble. I picked it up on the beach at Peel, on the Isle of Man, in 1988. It is a kind of stone called microgranite containing a mineral called riebeckite and originally came from a small Scottish island called Ailsa Craig, which is in the Irish Sea. This kind of rock is rather special. It is used to make the ‘stones’ used in the sport of curling, with the only other source of material for curling stones being a single quarry in Wales. 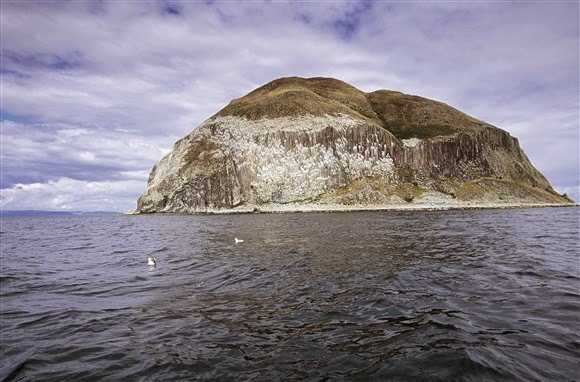 One company, Kays, has the exclusive rights to collect it from Ailsa Craig but they are forbidden from quarrying by blasting (as the island is a nature reserve), so must pick up stones that are already loose. I cracked a piece from the stone, then spent a couple of hours trying to find it again after it shot off into a big pile of timber in my workshop! When it had been located again, it was ground down using diamond bits in a Dremel hand drill (not forgetting eye protection, dust extraction and a face mask) and then polished with jeweller’s rouge. The groove around the stone will hopefully make it easier to set onto the handle, while the cross-hatching will give a key for the epoxy adhesive that I’m planning to use. After shaping the stone, I discovered that the island of Ailsa Craig has other names, one of which is Creag or Carraig Alasdair. It means ‘Alasdair’s Rock’ in Gaelic; very appropriate! The next stage was to make silver ferrules, one to go around the handle next to the blade and another holding the stone in place. Again, I didn’t have the time or the equipment to do a more technical silversmithing job like this, so I contacted local silversmith Amy R Lee. She made two beautiful silver ferrules and also sent them to Edinburgh to be assayed and hallmarked at the assay office there; a nice extra touch. When the ferrules came back, the knife was assembled and then sharpened. It has taken a very good edge and is razor-sharp now, perfect for whittling with! I also finished the wood with a furniture wax and buffed the blade. I’m very happy with it and I hope that you’ve enjoyed seeing how it was made. A sgian dubh is the knife traditionally worn with a kilt, tucked into the sock, as part of the Scottish national dress. The name means ‘black knife’ or ‘dark knife’ in Gaelic. There are different theories about why the knife is worn. One is that in Scotland’s wild past, people visiting others would be unwise to completely unarmed at any time. To show goodwill to their hosts, they would remove this knife and tuck it into their sock. They could still defend themselves if necessary, but their weapons were clearly on display. Another is that the knife was originally a ‘gralloching‘ knife, used to butcher deer. A dead deer was too big to haul off the moors and the stomach contents would immediately start to taint the meat after death, so it was best to cut it up there and then. The blade of my sgian dubh is damascus steel and was bought, as I do not have the equipment or skills to make a good blade of this type. As a carver, I didn’t want to wear a substandard blunt knife either! The silver work was done by a talented local silversmith for the same reason. She kindly sent the silver ferrules to Edinburgh to be given a Scottish assay office stamp as well. The materials used meant a lot to me personally. The timber used in the handle and sheath of the knife is laburnum, from a tree which grew in the garden of the house where I grew up and which was cut down long ago. When my mother was pregnant with me, she would rest in a hammock slung from this tree. The stone at the end is from a pebble collected on a beach at the Isle of Man many years ago, which originally came from an island off the coast of Scotland called Ailsa Craig. It has another name, which I found out after making the knife: Carreg Alasdair or ‘Alistair’s Rock’. Very appropriate! 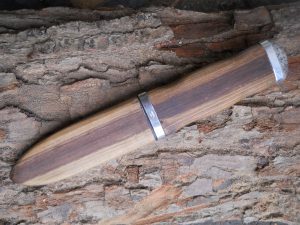 You can find out a lot more about this, the timber and the process of making of the sgian dubh on my blog. There is also more about the law concerning carrying such a blade in public in the UK. 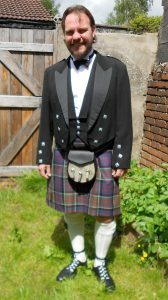 The kilt pin is worn on the outermost part of the kilt apron, mainly as an ornament but also to apply a little weight and stop the kilt raising. 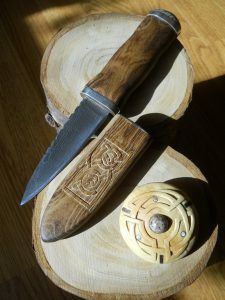 I was very happy with the first version, which was made using boxwood and the same laburnum and microgranite stone used in the sgian dubh. However, when my kilt arrived I realised that the colour and size just weren’t right! It was time to have another go. 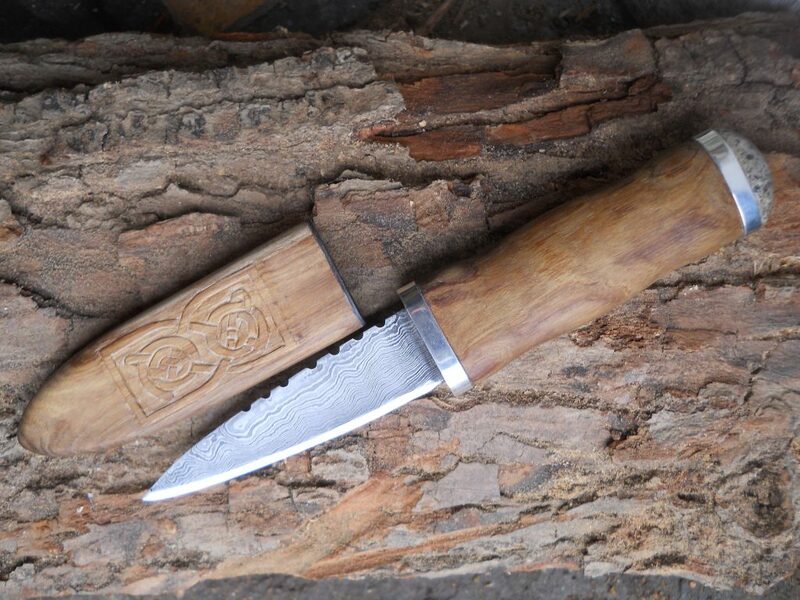 The second kilt pin is carved from the same laburnum wood used in the sgian dubh and uses a design taken from the Book of Kells, with inlaid silver, plum timber and reclaimed ebony. If you look carefully it isn’t actually a continuous knot, as such designs are often supposed to be, but is in fact two dragons interlacing with an infinity loop.